A large financial institution had an unsuccessful installation by another AV integrator. We were approached to provide a solution that would meet their Audio Visual needs for an executive boardroom. The client had a large boardroom which needed teleconferencing, presentation, control and recording capabilities. With video and audio recordings to be stored on the client’s network storage. AVC designed and installed a solution that would cater for these needs, but also catered for considerations that the client had not specified. AVC implemented an audio mix-minus system with this solution. This featured could have easily been omitted during consultations with the client but due to many years’ experience, asking the correct questions and most importantly listening intently to client’s needs, this feature was included in the system design. We carefully selected products during the system design phase. We ensured that the equipment list was kept to a minimum and would meet and surpass the clients expectations. AVC prides itself on offering clients Quality AV systems at reasonable prices and great value for money. A mix-minus system caters local sound/voice re-enforcement, which allows participants to hear each other clearly on opposite ends of the boardroom table. All participants can be heard clearly in the boardroom regardless of the volume of their voice. AVC’s in house programmers also had some clever tricks up their sleeve when it came to control system and Digital Sound Processor (DSP) programming. Gain sharing was opted for on the DSP rather than conventional microphone gating. This would ensure that no speech syllables were cut off on the audio system. 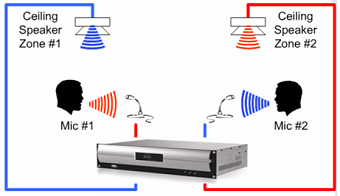 This would also improve the quality and intelligibility of the audio recordings. Powerlite custom cabinet to house AV equipment. AVC’s technical department designed, implemented and installed this system. AVC also provided control system programming and commissioning.